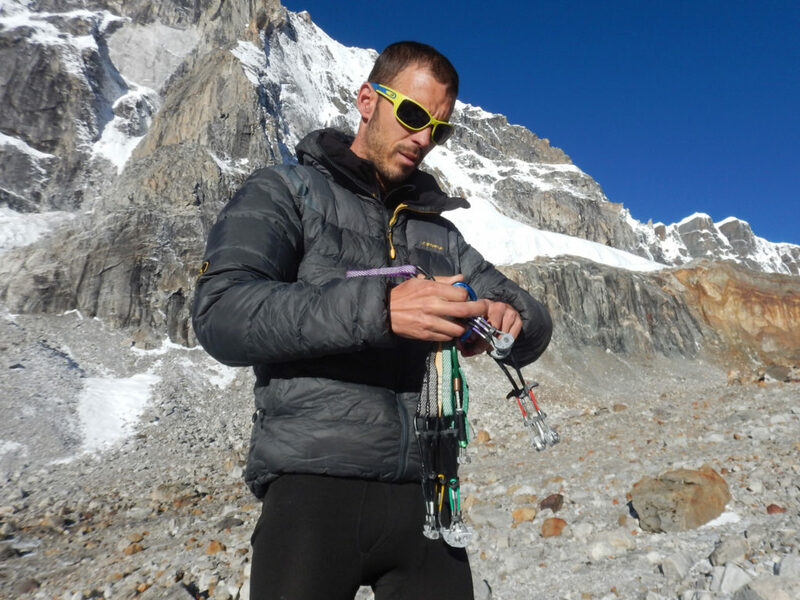 Our mate Angel Luis Salamanca left at the end of April of this year together with his mate Jao Garcia to Nepal aiming at opening a new route in an unclimbed 6000-meter close to Lobuche. By the end of April we headed to Nepal having in mind the idea of ascending the imposing northern face of Lobuche West, however a landslide from its wall, made us change plans and focused in a nameless virgin peak, of about 6080 meters high and 900 meters drop. 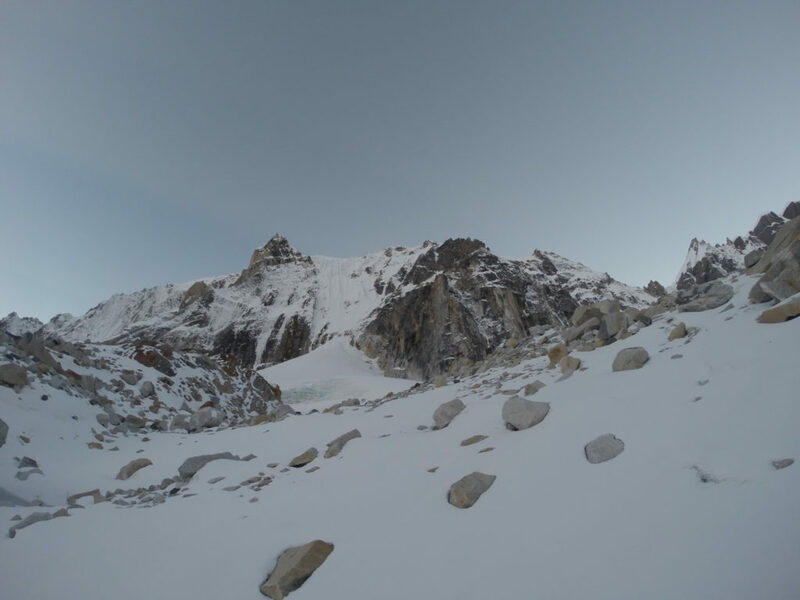 Such a peak is located in the Changri Nup Glacier, very near the Everest. It is a nearly unclimbed valley and hardly visited. We set off from the town of Lobuche, at 4900 meters high. We carried in two days, the material so as to be able to mount the base camp in a non rock area at about 5100 meters. It was very hard, a 10-hour trekking every day, snowing, with weather forecast against us, weight on our backs and a hellish moraine found is this valley. However, we have already settled down and are ready for the adventure. We started trekking at 3 o’clock in the morning using front lights. Our steps and the song of snow partridges inhabiting the area were the only sound. The first shape glanced at sunrise is the Everest. The way starts with good snow, but when the sun comes up, it starts to soften. We began with 55 to 60 degrees gradient so as to reach – as we go forward – the average 70 degrees and 80 degrees at the end, with a very hard ice and our backpacks on our backs to make a vivac. The weight of the backpack with the equipment for the vivac (which was not used eventually) and the 6000 meters were taking their toll. We gave up roping at a full length and started roping by for 15 meters. We put two or three screws and hung to rest. 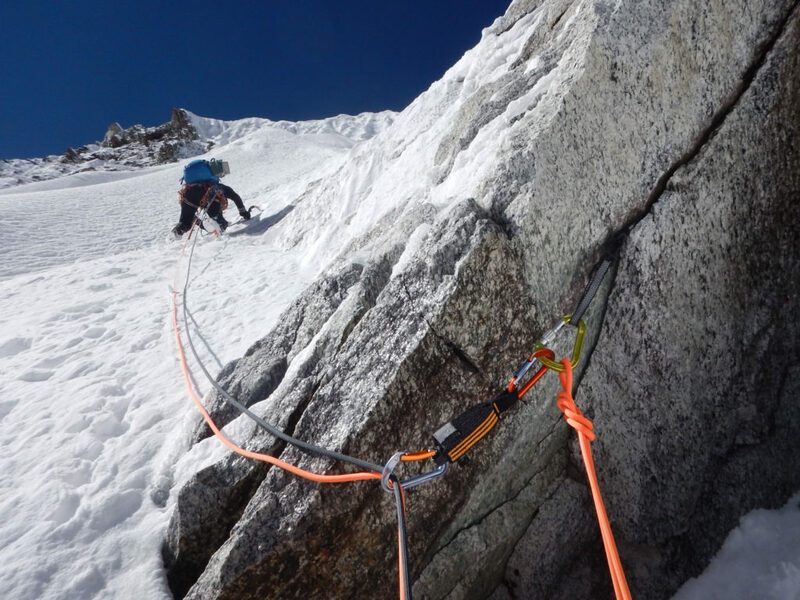 Protection was mainly by ice screws but also with some rock coming up on the spot, with some crevasse where to be able to place our Totem Cams or some Basic, which fitted perfectly. 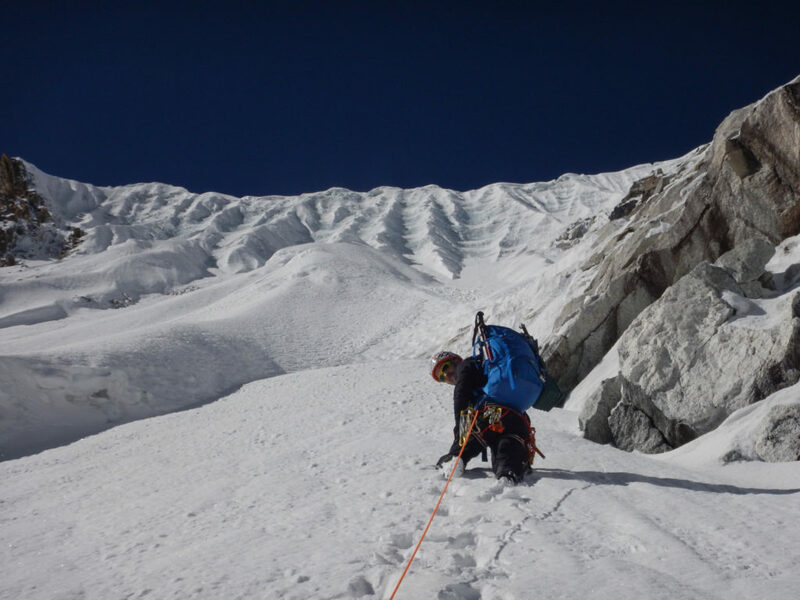 On reaching the top edge, it started snowing heavily – thick flakes which covered rapidly the crevasses on the floor what made me fall into one of them, holding on open arms so as not to get to the bottom. We didn’t work out the route well and came up at about 30 meters left-away of the top. So close and so far, with recently dropped snow and not seeing properly. We decided to come down carrying the same weight which had bothered us so much on the way up. I was about to kick it away to find it down later, on second thoughts I gave up nonsense. At 6 o’clock, shriveled as a prune, since we had nearly had no water, we reached the base camp. We left our backpacks leaning on a stone leaving them to be covered by falling snow. We got into the sleeping bags to relax till the next day, but the pain in my toes because of knocking with the crampons against the ice was such, that it prevented me from sleeping at all. In the morning, everything was recently-fallen snow-covered, the sun came up embracing us and Morpheus let us sleep for a little while.